Roger Newland Shepard is the Ray Lyman Wilbur Professor Emeritus of Social Science and Professor Emeritus of Psychology at Stanford University. 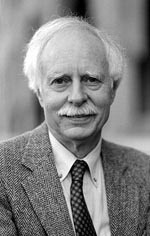 We honor Roger now for his contributions to psychology and to cognitive and behavioral science, which have been profound, elegant, and numerous. Moreover, they have spanned several important but nominally separate domains of human cognition, ranging from visual and auditory perception and representation through mental imagery, music cognition, learning, and generalization. His contributions include brilliant experimental work (as in his work on mental rotation), key methodological contributions (as in non-metric multi-dimensional scaling), and basic theory (as in psychophysical complementarily, second-order isomorphism, and the universal law of generalization). Roger’s legacy includes the launching of new areas of experimental research, a set of new and powerful illusions (including his ever-rising “Shepard Tones” and his stunning matching table tops), and a set of tools essential to those wishing to model mental representations spatially. His books include “Mental Images and Their Transformation” (1982, with Lynn Cooper) and “Mind Sights” (1990). Roger N. Shepard was born in 1929 in Palo Alto, California. He received his bachelor’s degree from Stanford in 1951 and his PhD from Yale University in 1955. Roger then worked at Bell Telephone Laboratories and at Harvard until moving back to Stanford University in 1968 and serving on their faculty for over 30 years. Roger Shepard is a fellow of the American Association for the Advancement of Science and the American Academy of Arts and Sciences, and also the William James Fellow of the American Psychological Association. He was elected to the National Academy of Sciences in 1977. In 2006, he was awarded the David E. Rumelhart Prize for contributions to the theoretical foundations of human cognition. In 1995, Shepard received the highest scientific award given in the United States, the National Medal of Science. * The FABBS Foundation would like to thank Dr. Stephen Kosslyn and Dr. James Pomerantz for nominating Dr. Shepard for this honor and for leading the effort to spread the word about his nomination. Would you like to honor Dr. Shepard? It’s not too late to have your name added to the list of donors! You can make your donation to Dr. Shepard’s In Honor Of… campaign at anytime.